WASHINGTON -- The head of the International Monetary Fund hailed South Korea's plan to draw up an extra budget, South Korea's finance ministry said Friday. IMF Managing Director Christine Lagarde said an extra budget is a policy direction that meets the international lender's recommendations. She made the comments in a meeting with South Korean Finance Minister Hong Nam-ki on the sidelines of the spring meetings of the IMF and World Bank in Washington, according to the ministry. 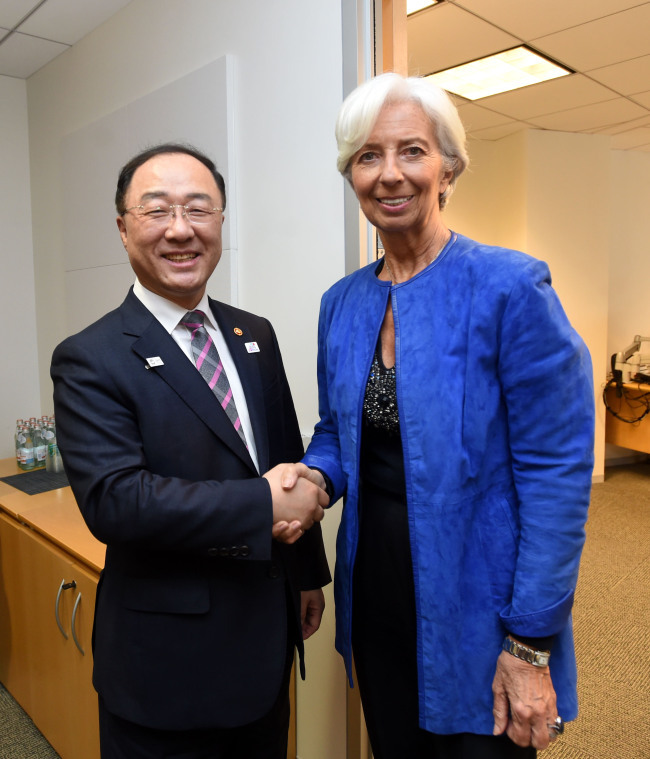 Hong told Lagarde that South Korea is working on an extra budget to preemptively counter downside risks. Earlier this week, Hong said in Seoul that he expects to introduce a supplementary budget worth less than 7 trillion won (US$6.1 billion) to boost domestic demand and create jobs. The extra budget is also meant to cope with fine dust air pollution. The South Korean government is set to submit an extra budget bill to the National Assembly later this month for approval.